Governor Andrew Cuomo Provides Proclamation to the S.V.A. Although Governor A.M. Cuomo and the First Lady Sandra Lee were upstate on pre-arranged official business, the governor personally sent a high-ranking, openly Gay official David Alden Turley. He attended the annual "S.V.A. Conference & Reunion" and stayed! Alden presented the Governor's Proclamation to the SVA's founder and director Willson Henderson. But first, the significant proclamation on the 49th anniversary of the 1969 Stonewall Rebellion and the foirthcoming 49th anniversary of the S.V.A., was publicly well-read by Alden. New York State's superfine Governor Andrew Mario Cuomo ("AMC") sponsored a wonderful, happy and Gay cocktail party with served quality foods. Gay event was for specially invited, prominent and worthwhile members of the G.L.B.T. community. New York's lovely (in all ways) First Lady Sandra Lee was so sincere at personally working the entire welcoming crowd. Representing the S.V.A. were its founder and director Willson L. Henderson and general manager AnDre M. Christie. 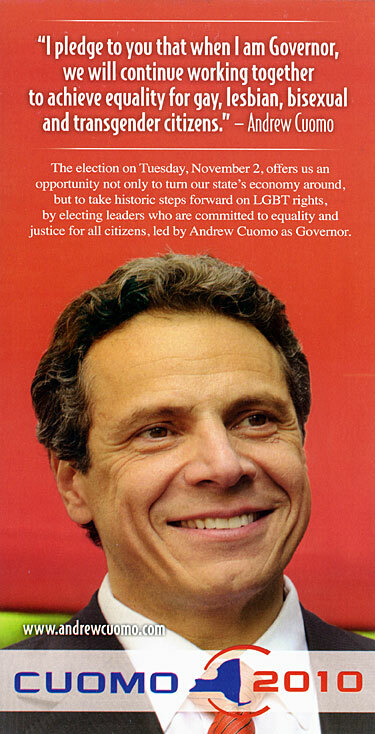 The Cuomo Family has been a supporter of the STONEWALL Veterans' Association since the 'mayoral' Summer of 1977! Representing PRIDE Democrats of NYC, the only other longtime GLBT group supporter of AMC, was Steven L. Gradman and Marlon W. Hunter. The upbeat event was joyfully hosted by openly-Gay, former NYC Council speaker Christine Quinn. WLH presented the Cuomos with two original "Songs of the Stonewall Club Jukebox" compact discs. Willson assured that they will love the songs from Sinatra to The Supremes and 25 other artists! "The Happening" today was @ 6 to 8 p.m. at the scenic Hudson Terrace overlooking the Hudson River! 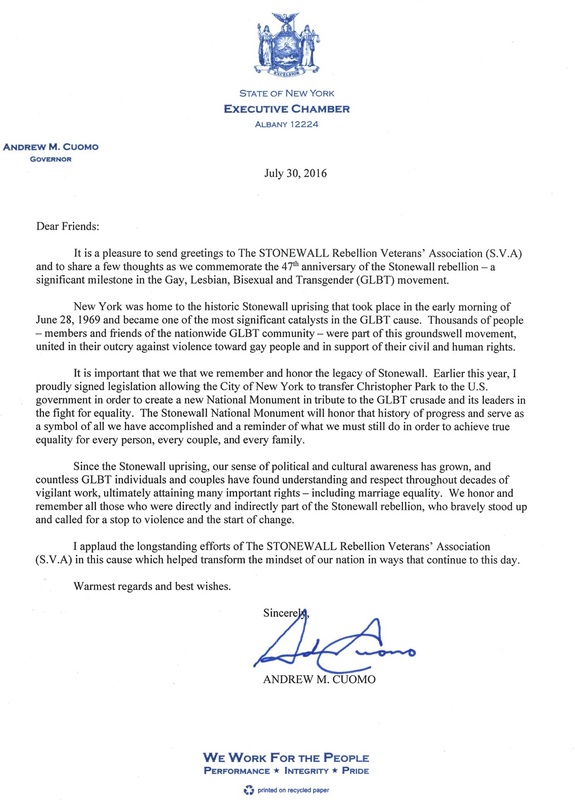 This NYS governor, Andrew Mario Cuomo, is the most respectful and thoughtful governor of the STONEWALL Rebellion Veterans Association ("SVA") than any of his predecessors -- though they were albeit much lesser degrees! This year, the governor's high-ranking, openly-Gay, state legal counsel Alphonso "Alfie" David personally partcipated and presented the Proc at the SVA's well-attended annual "S.V.A. Conference & Stonewall Veterans Reunion". Later, Alfie had a WLH-planned exit theme of , what-else, the Stonewall song "Alfie" (by Dionne Warwick). Note: All 3 candidates are supportive of the STONEWALL Vets' Assn. 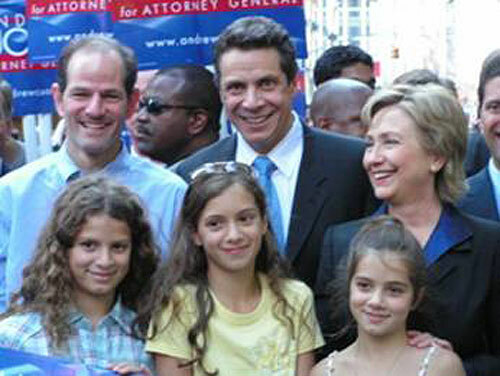 Note: Campaign signs in background are for Andrew for NYS Attorney General. P.S. At least one of the candidates shown is Italian on Columbus Day! ADVISORY: THE S.V.A. HAS MUCH MORE 411 AND PIX TO BE PLACED ON THIS A.M.C. WEBFILE! Note: This webfile is in progress with plenty of 411 to add!